Are you a Wild Woman, who is inspired by FREEDOM? Living life on your own terms? Someone who wants to take control of her life? How you spend your time and whom you want to spend it with? Maybe you want to make an income, working from home, on the beach, working around your children… or even better, working around the world!? You may want to start a side business and someday, quit your job. Or maybe you’re a coach, consultant, running a service based business. Wherever you are on this road of life, I am sure you’re gonna take away some golden nuggets that you can contemplate and apply, so that you can spend it on what matters most in your life. As we know, time is our most precious commodity. Once it’s spent, we can never get it back again, so let me take you through an idea that once set up, can potentially help you save more time, so you can travel, spend time with your loved ones, make money in all the corners of the earth… and make better life choices. So today, I’m going to share with you the concept of starting an online business! That’s correct ladies! I know some of you are quite traditional and the thought of starting or running an online business, is overwhelming… and that’s understandable. But there are so many benefits to getting started on an online business and it really is worth looking into. No matter the challenge… like my mentor Marie Forleo says… EVERYTHING IS FIGUREOUTABLE! Whatever you don’t know, you can work it out. Or you can hire someone to do it for you. So don’t let the overwhelm stop you. Whether you own a coaching business and want to brand your business, or yourself. You might even be someone who has an exciting product to share with the world. Or a stay at home mom, who wants to work from home, around her children. Whoever you are, know this… owning an online business is the future. So why an online business? Well for one, more and more people are getting online! Let me ask you something. When you are searching for answers for anything these days, what do you do? That’s right! You google it! As I speak, according to live worldometers, there is now over 3.35 billion internet users worldwide. That’s 46% of the worlds population every year using the internet. And in the past few years it has been rising by an average of between 7% – 10%. In 1995, it was less than 1%. And even better, more than 1 billion people have bought products or services online. The growth of people who are now purchasing online is MASSIVE. So what does that mean if you get your business online? Well 1, getting your business online has incredible SCALABILITY. By having an online presence, you have the potential to reach a WORLDWIDE market. And you have the ability to run it 24/7, even while you are sleeping! Two, there are no geographical boundaries. You’re not limited to where you do business. It’s not like running a local café or clothing store. Where you are limited to the amount of customers in the local area, who walk through your door. And better yet, if you have the right business model, you can produce revenue even while you are sleeping! Now how awesome would that be? With a well thought out social media plan, understanding and applying successful search engine optimisation and advertising strategies, an online business can really THRIVE. And the great things is, there are many ways to find someone who can help you with this, even if you have a small budget! Overall the biggest benefit is, you have access to the world at your fingertips. You have the luxury of being able to speak to the exact people who you can help. Or the exact client that you want to attract. And you know what else it gives you? It gives you limitless freedom. Modern technology now gives us the opportunity to do business from anywhere in the world. As long as we have internet connection! We no longer have to be tied to a desk. We can do business via a laptop, our smartphone or tablet. And there are so many business tools that can use to make our lives a whole lot easier. Such as Skype or goTo meeting! This means, that you could be running your business on the top of Machu Picchu or on a tropical island, while sipping on a mango shake, as you get a foot massage. Now how awesome would that be? And as a bonus…. online business offers low overhead and high profit margins! Not only will you be able to eliminate the cost of renting – where you’re locked into a long term lease.. you can also set up your business so that you can eliminate the need for massive inventory. There are plenty of companies out there who provide drop ship agreements and this can greatly reduce your financial risk. And that’s the power of an ONLINE BUSINESS! So how does online business work? Well first and foremost, you must have a website. Consider your website as a prime piece of real estate. It is your shop front and the first thing that people see when they connect with you, your product or your service. The purpose of it is to generate profit, grow your list of clients and customers, offer free value to build trust and generally help people. And it can help you build your story, offer your uniqueness to the world so you differentiate your business, from your competitors. And more importantly it should help you directly sell your products or your services. So consider the traffic coming in and out of your website, as people walking in and out of your shop. If they like what you are offering, then they can buy from you! If you’re selling products, whether this is a physical product or a digital product, your customers can purchase through a sales page or an online store using e-commerce. Or if you’re offering a service, for example…. if you have a coaching business… you can coach them via phone or Voice Over IP like skype. So you don’t even have to be physically in the country to work your business! I’ll throw in some examples for you… just to get your imagination going. Remember that you are only limited by your own imagination! So let your imagination go wild girlfriend! For all you coaches out there or anyone who provides a service, as mentioned you can definitely take your business online, by promoting yourself and then offering online consultations via skype. You can provide a membership site, where your clients can pay for your content and your tuition on a monthly basis. Or you sell coaching packages too, where its more 1 on 1. For those who have a product to sell, you can start with an eBay account. Or for a professional look, you can use tools such as Shopify, Big Commerce or Wix.com where you can fully customise your online website. And for those who want to educate, you can sell your tutorials and courses online! Do the work once and sell it forever! So there it is ladies. A lot of exciting stuff in running and owning an online business. 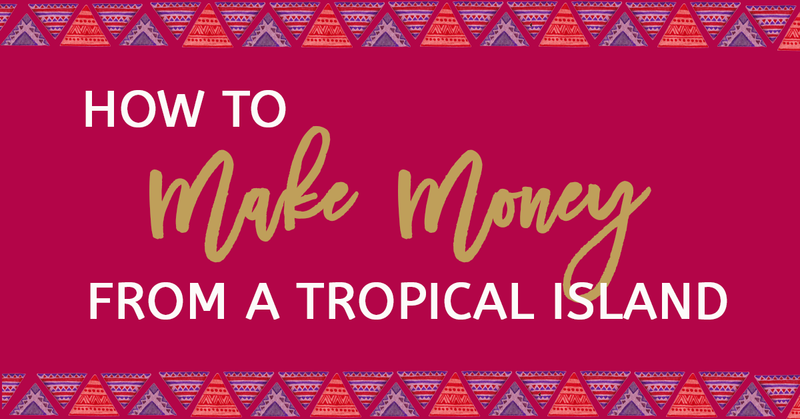 Obviously it’s going to take some thought and some work, but once you get it going you will be able to make money from the beach on a tropical island, drinking mango shakes! For those of you who are interested in venturing into the online business world, I offer some private 1:1 coaching that can help you get started. Whether you want to define your ideas and bring it to life or if you want to start your business from scratch, visit the WORK WITH ME page for more information. If you liked this content, please leave a review on your podcast App. Or you can leave a comment at below! And if you want to join the Wild Woman Run Free Tribe, so you can get FREE access to Ideas, Tips & Resources that will help you create a LIFE of PASSION, PURPOSE and FREEDOM, find us on Facebook at Wild Woman Run Free or sign up at the TOP OF THIS PAGE. Let me just say… again… that the only barriers that you have in life, is the barriers that you put in front of you. Remember that you are the creator of your life. Noone else. Go for your dreams…and don’t let anything stop you! Live Wild. Live Free. Wild Woman Run Free.